Crispy panko-coated sweet potato balls bursting with the flavors of the Southwest and paired with a zesty yogurt crema sauce for dipping. I know it might be a bit early to be posting about Thanksgiving leftovers, but you may find yourselves making these well before Thanksgiving. I was trying to come up with an idea that used Thanksgiving leftovers, yogurt, and was kid-friendly for the latest challenge from Stonyfield Farms’ Clean Plate Club. My initial ideas were easy things like muffins and parfaits. But I wanted something a bit different. So then I thought of croquettes, but I figured that’s been done to death and I wanted something that wasn’t obviously trying to use up leftovers. 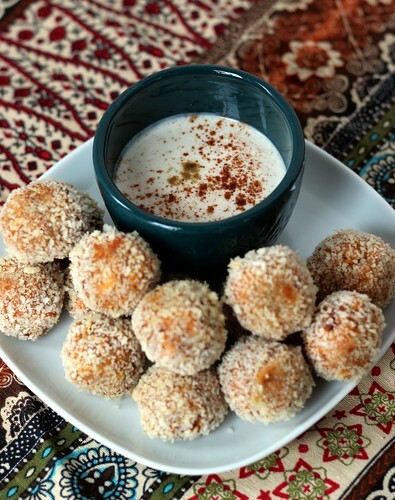 And then I thought of creating bite-sized sweet potato balls with a Southwestern flair, to get us away from traditional Thanksgiving flavors. Yogurt crema for dipping seemed to be the perfect way to incorporate yogurt into this recipe. This really is an easy recipe to put together — after cooking all that food for Thanksgiving, do you really want to spend that much more time in the kitchen? I didn’t think so. It’s easy enough that little kids can help out as well. You’re basically taking leftover sweet potatoes, mashing them, and then combining them with mashed beans (use refried beans if you’re lazy like me), cheese, and some seasonings. Then you’re forming little potato balls and rolling them around in panko bread crumbs and then baking them. The crema is even easier — you’re just adding some lime juice and spices to the yogurt and mixing it together. Told you this was easy. Why wait for Thanksgiving to be over to make these? Make them and serve them next time you’re watching a football game or have people over. lime juice, chili powder, minced garlic, ground cumin, and salt to taste OR substitute taco seasoning for the spices. Preheat oven to 350 degrees Fahrenheit. Line a baking sheet with aluminum foil and spray with cooking spray, set aside. Place the panko crumbs in a small bowl and set aside. In a medium-sized bowl, combine the sweet potatoes, beans, cheese, taco seasoning, and salt. Form sweet potato mixture into 1.5-inch diameter balls with your hands, then roll in panko crumbs. Place each sweet potato ball on the prepared baking sheet. Spray with more cooking spray. I got 14 balls out of my sweet potato mixture, so you may get anywhere from 12-16 out of yours. Once all the sweet potato balls have been formed and rolled in crumbs, bake for 15-20 minutes, or until they are golden brown. Combine the yogurt, lime juice, chili powder, garlic, cumin, and salt until taste is to your preference. 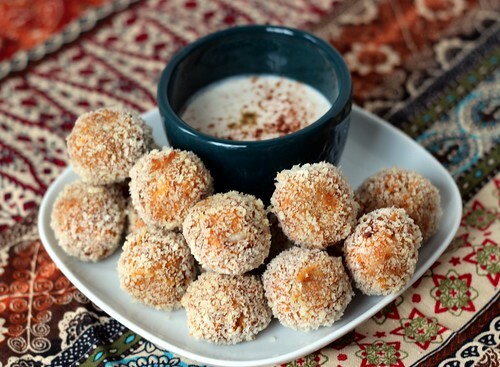 Serve the sweet potato balls with the crema for dipping. My husband loves sweet potatoes! We don’t normally have any “leftovers” haha but I will make some extra for these! These are such a great reason to make extra! Hope you enjoy them!